Carrie Fisher has likened returning with Harrison Ford and Mark Hamill for 'Star Wars: The Force Awakens' is like having a "school reunion"
Carrie Fisher feels like the new 'Star Wars' movie is similar to a school reunion. 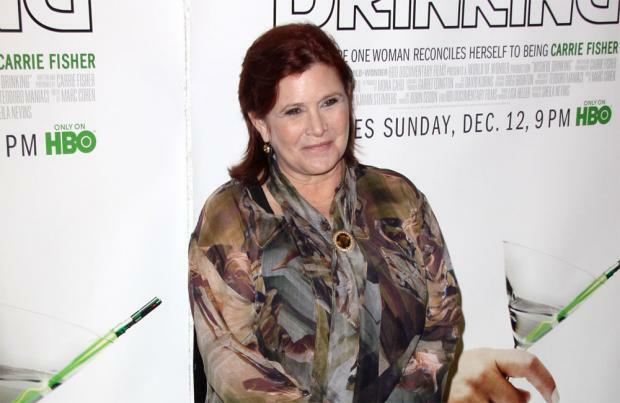 The 59-year-old actress is reprising her role as Princess Leia in 'Star Wars: The Force Awakens' and was excited to be reunited with Mark Hamill and Harrison Ford for the highly-anticipated film. She told the Sunday Express magazine: "The new actors are great. We're like the old guard who come back and we have a reunion and they're the freshmen. "I understand - there is just this insane interest. People grew up with these characters, so it's their childhoods." Meanwhile, Carrie previously revealed she had to shed two and a half stone ahead of her role in the science fiction flick. She shared: "Nothing changes, it's an appearance-driven thing. I'm in a business where the only thing that matters is weight and appearance. That is so messed up. They might as well say get younger, because that's how easy it is. "When I do lose the weight I don't like that it makes me feel good about myself. It's not who I am. My problem is they talk to me like an actress but I hear them like a writer."